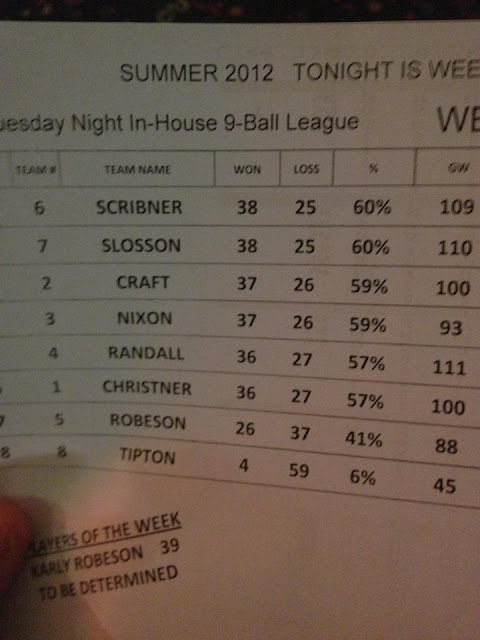 One of my favorite leagues is the Coed 9-ball league on Tuesday at Madsen's during the summer. The format is a 3-person team (1 female required) with a 27-game format, this allows you to play each opponent three times...and it moves pretty fast on only one table. The main reason to play this league is to get sanctioned for the Heartland Tournament in Columbus. My wife played on a different team, so I teamed up with our friends Matt and Brandi Slosson. We all played pretty well overall, I can remember the specifics...but my W/L record was pretty crazy at like 56-16 or something like that. Matt played very well, especially when we needed it in the final week in the position round. Brandi made some really tough shots, but didn't always get rewarded with another shot. The teams were pretty tight going into the final week position round as you can see below. Theoretically, the 6th place team could have won the league...we went 6-3 for the win, but they could have won 9-0 to win it all. The payout was very good at $80 each, which was all of our money back since it was $10 a night for 8 weeks. I recommend this league to anyone that wants to try out something different than a regular old 8 ball league.